Sony sent me their new Xperia Miro smartphone recently. Xperia Miro is a slim, stylish smartphone with Facebook social experiences integrated throughout. Users are alerted to new incoming messages and social updates with colourful illuminations. Miro lights up your incoming alerts in your favourite colour. Facebook notifications flash in blue and your calls and alarms show off in the same colour as your theme. White, blue, turquoise, green, gold, red or purple. Xperia Miro has a 3.5” display and runs on Android 4.0 (Ice Cream Sandwich). It has a 5MP camera, 2 GB user-accessible memory, 512 MB RAM, expansion slot for microSD cards (up to 32 GB) and also comes with Sony’s xLOUD audio technology giving crisp and loud sound. The Friends widget on the Xperia Miro gives you the most recent news from your favourite friends on social networks such as Facebook and Twitter. Timescape feed lets you stay in touch with your online friends and the world. Check out a video of the Friends widget in action. The Xperia Miro is available in Singapore in the colours black and white-silver at a recommended retail price of S$368 without contract at M1. Dude takes a still from a multi-million dollar animated film that required thousands of man-hours to create and replicates it using Maya and Photoshop in about 30 minutes to an hour! 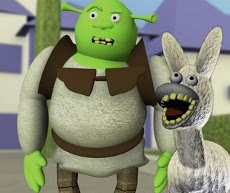 This is his recreation of Shrek. Save the vinyl, save football! Pascal Claude has a collection of about 1000 vinyl 7" records on football. You can listen to all the records in his collection online. 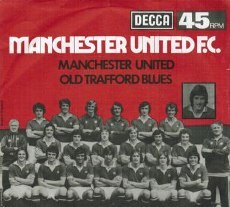 I've discovered a few gems there including this 1976 Man Utd Old Trafford Blues record and my favourite 1982 Tottenham Hotspur FA-Cup souvenir record. Dude's family owns a small jewelry store in Sacramento. 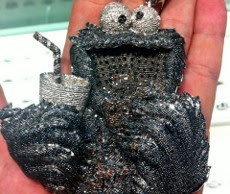 Last year, they bought this custom made Cookie Monster bling from a customer. It is made of 132g of solid white gold and 17 carats of diamonds! Singaporean fashion designer Uenki sells handcrafted geeky items on her Etsy site. She's been making beaded jewellery for family and friends since 2002. 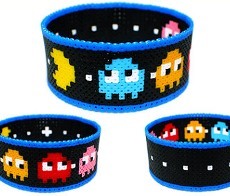 This cute Pacman bangle is made using 2.5mm mini hama beads and comes in bangle or adjustable bracelet version. I like her Nyan Cat bangles too! 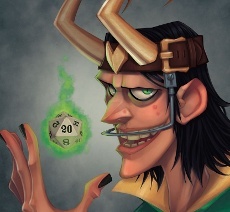 GhostHause imagines how some of the most popular supervillains may have looked like in their highschool yearbook. His collection of supervillains' high school yearbook photos were made specially for the Austin Comic Con. There are 6 supervillains in his collection: Loki, Green Goblin, Two Face, Venom, Bane and Sinestro. These vintage Halloween postcards are from the New York Public Library Picture Collection. 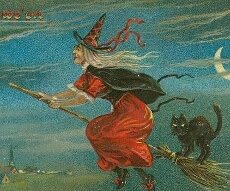 This one pictured on the left is from 1910 and shows a witch and her cat on a flying broomstick. As some of these cards show, Halloween was not only celebrated with children “trick-or-treating” but with parties for young adults. 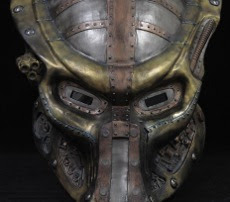 Skunkworks Props make this awesome steampunk Predator helmet which is cast in fiberglass: "Finishing is done with a combination of waxes, metal rubs and airbrushing to get a weathered finish that is full of texture and detail." There are lots of Gangnam Style parodies out there - I even directed one for Fabulous You - but this one by animation studio NGSMOOV is now my all time favourite. It's Transformers Gangnam Style! Thanks Universal Music Singapore for the exclusive invites to Richard Marx Stories To Tell Private Showcase which was held at St James Neverland II last night. Stories To Tell is an acoustic album released by Richard Marx featuring several songs from his previous albums in newly recorded acoustic versions as well as two brand new tracks Like Heaven and Through My Vein. Richard Marx performed 10 songs from his Stories To Tell album at the showcase which was attended by about 600 people. Richard's voice was amazing live. It was just him and his Gibson guitar. Pure brilliance! He played the piano during the last song of the night, Right Here Waiting. Highlights of the showcase for me has to be Hazard and Save Me featuring Richard's 3 sons, Brandon, Lucas and Jesse playing with him on video. I was a bit disappointed he didn't perform This I Promise You, a song he wrote and was made popular by 'N Sync but watching him perform Hazard live makes up for it. Hazard is my favourite Richard Marx song. Trust me. It's so much awesome live and unplugged! Richard Marx's Stories To Tell is available exclusively in Singapore at That CD shop. You can preview some of the songs in the video below. My Big Bird Reacts to Romney video is on CNN! Thanks everyone for spotting my Big Bird reacts to Romney YouTube video aka Big Bird Screams video on CNN! I was also told the video was on Fox News. Heee! Watch the CNN report below. From CNN: "CNN's Jeanne Moos milks the mockery of Mitt Romney plucking Big Bird and then Big Bird pecking back." My video is at the 0:51 secs mark. You can subscribe to my YouTube channel with more than 6 million views here. Thanks! Unwrapping a condom is one of the most challenging things a guy can do so I welcome this timely invention of the One-Handed Condom Wrapper. It uses a one-handed finger snapping action to exert enough force to break the wrapper, revealing the condom and forcing it to slide out between finger and thumb. 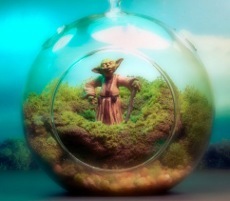 This beautiful Yoda Terrarium contains an adorable vintage Yoda figure, hand carved terrain and custom planted landscape. You can hang it or just place it on a table. Made by The Wonder Room which specializes in terrarium-style dioramas. There's a R2D2 Terrarium too! Sony Blu-Ray player is Wife ready! Here's a hoodie that transforms you into the Autobot leader, Optimus Prime! 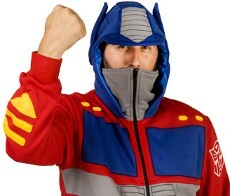 Pull the Optimus Prime Costume Hoodie over your head, zip it all the way up and you are ready to be Optimus Prime. There's also a Grimlock costume hooodie for fans of the T-rex transforming Dinobots leader! I like!!! 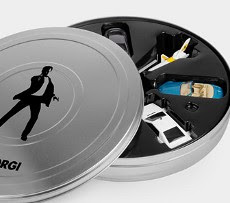 The James Bond 007 Miniature Vehicles Set comes with 8 die-cast models featuring some of the most memorable vehicles from the James Bond films. Vehicles include the BMW Z3 from GoldenEye, the Aston Martin DBS from Casino Royale and the Space Shuttle from Moonraker. 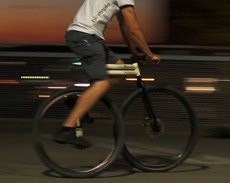 The folks from Scalyfish Designs have successfully redesigned the bicycle into an ultra compact design minus the chain! Yes, no chain! They called it the Bicymple. It has a direct-drive, freewheeling hub which joins the crank arm axis with the rear-wheel axis thus shortening the wheelbase and minimizing the design. An artist collaborative called Kingyobu in Osaka turns rusty old phone booths around the city into fun and simple art installations for the public to enjoy for free. 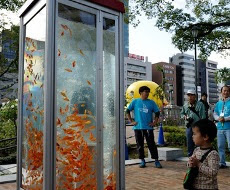 Here they are converting the phone booths into giant aquariums filled with lots of goldfish. Check out my video of Big Bird's reaction after US Presidential candidate Mitt Romney says he wants to stop subsidy to PBS, the non-profit American public broadcasting network that provides free-to-air television to around 170 million Americans with a focus on educational programming. Sesame Street is one of the shows on PBS. It receives funding from PBS but very, very little. I finally tried taking some pics and videos over the weekend with the Olympus Pen E-PL3 camera and a Holga lens (thanks Snap Shop). Holga lenses give your digital photos the classic Holga look with the dark corner vignetting and the soft focus so beloved by the analog crowd. Here's a picture of the Olympus Pen E-PL3 with its standard Olympus M.Zuiko 14-42mm zoom lens. And here's the Holga 25mm lens on the Pen. Weighing only 38g thanks to its plastic body and lens, the Holga lens has a fixed f/8 aperture and a manual focus ring. Focusing is a nightmare on the lens because the focus ring is so tight but if you're taking a lot of outdoor shots then just leave the focus on the lens to infinity. Some shots with the Holga lens below. If you're into the lo-fi effect craze started by Instagram and Hipstamatic, then the Holga lens would be a cool lens to have for your digital camera. Note that the images you get with the Holga is far inferior than the ones you will get using your standard lenses. It is after all, a plastic toy lens. I was more interested to shoot videos with the Holga lens using the Olympus Pen's diorama mode which gives the video a miniature model look thanks to its tilt-shift and time-lapse effects. Here's one that I took. Watch the video (HD link) above. And lastly, another diorama video (HD link) taken using a combination of the Holga lens and the Olympus M.Zuiko 14-42mm zoom lens. Pretty nice aye. If you're interested in getting a Holga lens, do check out Snap Shop. They specialise in analog photography.